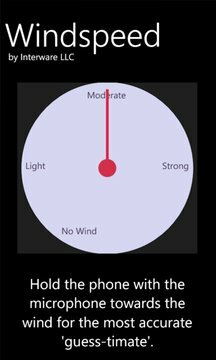 Windspeed is an anemometer that makes a more or less accurate estimate of the current wind speed at your current location by measuring the volume of the sound blowing into the phones microphone. Provide your feedback so we can improve the accuracy of the application. Finally updated for Mango and also for Tango! Working on higher accuracy amongst all Windows Phone models.